With this in mind, we wanted to put up a comparison against some of the competing diabetes apps on the market and highlight where we think MyNetDiary is truly better. 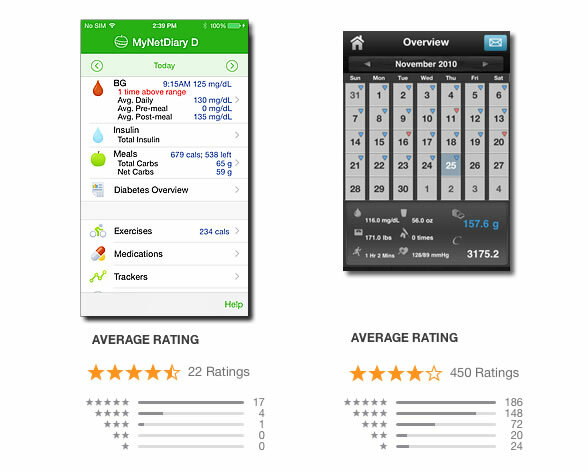 Here we compare MyNetDiary Pro vs. Diabetes App – one of the most popular iPhone diabetes apps. One important consideration is that MyNetDiary has worked exclusively and professionally in the area of diet, weight loss, and diabetes since 2005, providing comprehensive online and mobile services and apps, while BHI Technologies (the maker of Diabetes App) is one of many newer "app developer" companies and its Diabetes App is just one of their 50+ apps from all walks of life, including Fake Call, To Do, Music Download apps and such: see BHI Technologies, Inc app list. Most importantly, MyNetDiary keeps working on the diabetes app and keeps improving it following user feedback and the latest technology developments. Diabete App is no longer seems to be updated or maintained, as the last update was in November, 2013. Food Database – MyNetDiary has 705,000 verified foods database, updated daily. MyNetDiary Diabetes Tracker provides awesome PhotoFood Service – for foods that are not in the database or out-of-date you can send their photos directly from the app, which will be verified and entered by MyNetDiary's professional data entry team, resulting in higher quality database. Online access – MyNetDiary app can sync to MyNetDiary's website, for backup and online entry of foods and exercise. MyNetDiary Maximum subscribers can track online all diabetes related information, the same as in the app, including blood glucose, insulin, and medications. Comprehensive – MyNetDiary tracks up to 45 nutrients, tracks all body measurements, blood pressure, A1C, LDL and HDL cholesterol, vitamins, notes, and more. And MyNetDiary keeps it simple – all these features are there when you need them! Diabetes App tracks only 10 nutrients including calories.